Hello, this is the Strohm Family checking in on our second day of safari. After our celebration at the Mweka Gate with Tracy and Katherine, we started our safari yesterday with Francis. 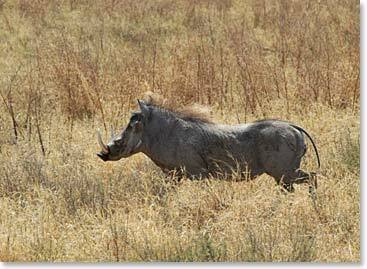 Our first stop was Tarangire National Park. We have seen lions eating wildebeests, zebras, giraffes, baboons, elephants, monkeys, all kinds of things. 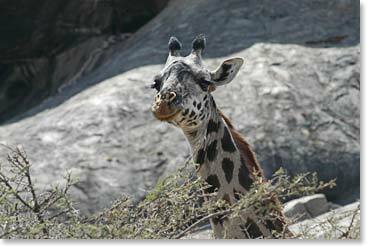 We’ve had really good weather and Francis has taken us some amazing views of the animals. 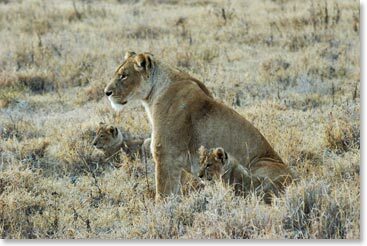 Today we started at Tarangire National Park and this morning we saw a male lion and his pride. We got to see about nine lions all together. We left Tarangire and went to Lake Manyara. 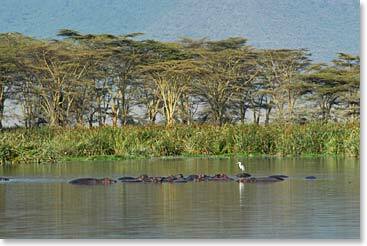 We got to see hippos there, including some hippos fighting. We also saw an elephant who was very, very young and was nursing with its mother. Now we are at the Ngorongoro Crater with a beautiful view of the crater below. We also stopped at the Karatu Market, though we didn’t go in. We are all doing well and we’re having a blast. 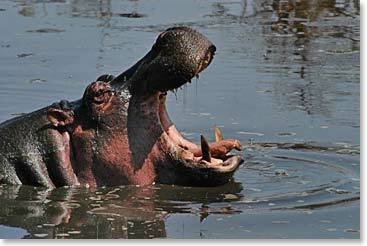 Is that hippo hungry or angry?